When the Titanic struck an iceberg on April 14,1912; where did the Titanic sink? After the collision, the ship broke into two large pieces and into many smaller pieces creating a debris field approximately 15 square miles in size on a gently sloping canyon on the ocean floor. The debris was scattered in an area of the North Atlantic about 1,200 miles northeast of New York City. The geological features of the shipwreck site is well documented in several scientific journals and with the use of the Google Earth app many geological features of the ocean floor such as depth and distant from various cities can be determined relative to the site. The Titanic shipwreck is located in the Newfoundland Basis right near the small triangle indicating 12, 740 ft. If it had sunk a few hundred miles further south the pieces of the ship would have fallen in valleys further south. 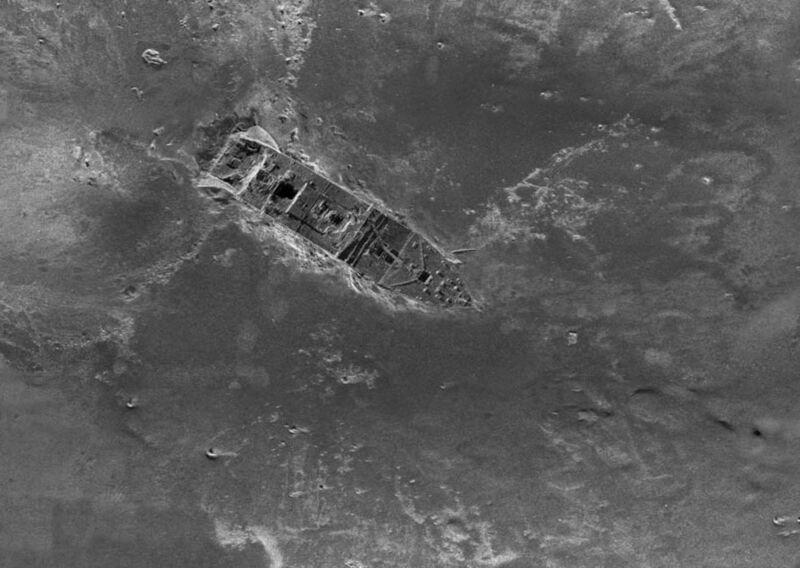 The Titanic shipwreck sits just to the right of the Sohm Plain. The Grand Banks of Newfoundland sits slightly above and right of the Sohm Plain. The exact location of the Titanic wreck was determined after the bow and stern sections of the Titanic were discovered and recorded by Dr. Robert Ballard in 1985. The positions of the bow and stern are 49 deg 56 min 49 seconds West longitude, 41 deg 43 min 57 seconds North latitude and 49 deg 56 min 54 seconds West longitude 41 deg 43 min 35 seconds North latitude in 12, 600 feet of water (about 2.5 miles below the ocean surface). These numbers indicate that the Titanic shipwreck is located in the northern and western hemispheres of the Earth approximately halfway to the position of the North Pole from the equator. It is located in the Newfoundland Basis. The exact location of the shipwreck is also marked in the Google Earth app along with photos of the site. 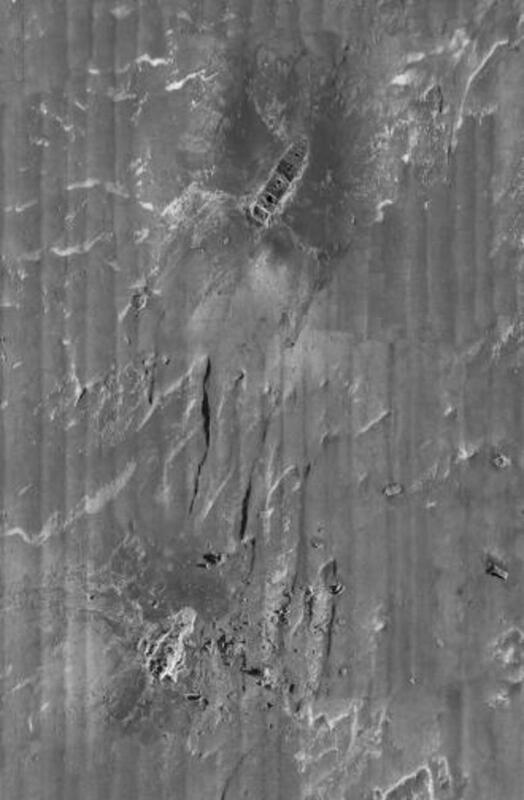 Geologically speaking, the wreck of the Titanic landed on a relatively smooth, sandy section of the North Atlantic floor which made it possible for research teams to study the wreckage without too much difficulty. According to some researchers, the wreckage will eventually be buried in about 50 years by sedimentation from strong currents moving through the area. Slumps - are clumps of waste material or consolidated material that move a short distant down a slope. Barchan Dunes - are arc-shaped sand ridges. The arc faces the opposite direction of the flow, underwater current in this case. Sand Ribbons and Sheets - they are long strips of sands surrounded by immovable gravels. These are formed by high velocity underwater currents. Mud Waves - wave-like patterns made on the ocean floor made from the slow movement of mud caused by underwater currents. 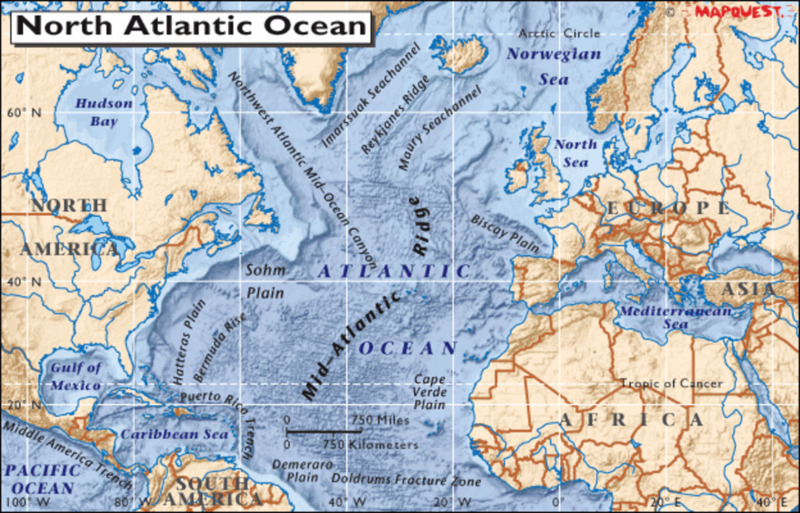 After the collision, the Titanic and its debris came to rest in the region of the North Atlantic Ocean where two major underwater currents converged. 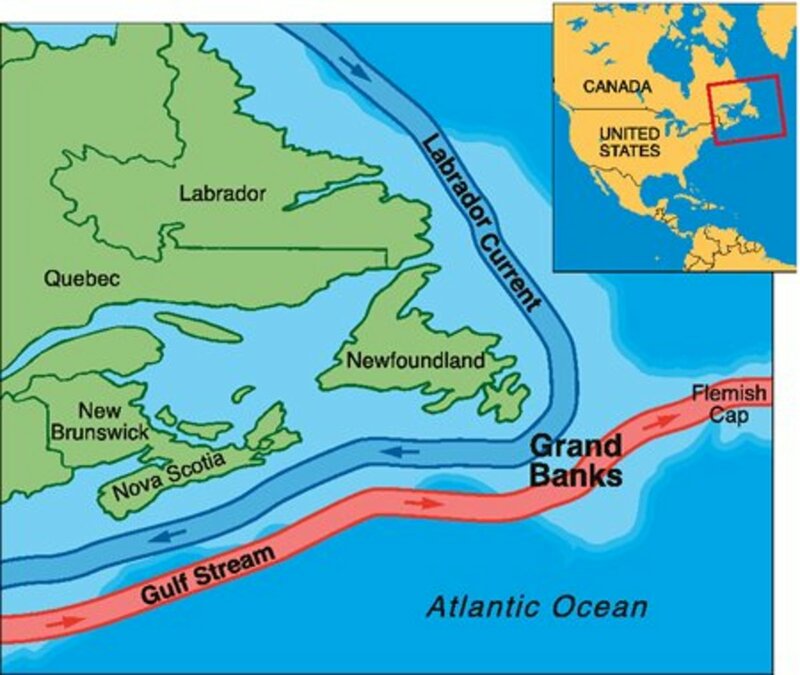 This region is near the continental shelf of Newfoundland called the Grand Banks. 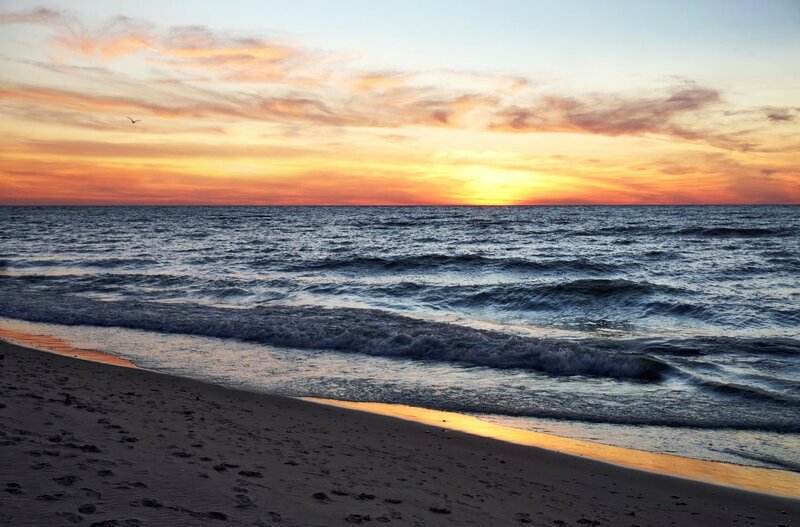 The water moving through the area originates from the warm waters of the Gulf Stream which flows northward along the eastern seaboard of the eastern United States. The second current of cold water called the Western Boundary Undercurrent starts around Greenland and Labrador flows southwesterly along the United States continental shelf. These currents are probably the reason why the debris from the sinking is scattered over such a large area, and furthermore, it fell for 2.5 miles. Also, the mixing of these currents is known to cause foggy conditions in this region of the Atlantic Ocean. Some investigators of the Titanic sinking believe it was low surface fog that may have made it impossible for nearby ships such as the Californian to get a visual on the doomed ship. This region, off the Grand Banks beyond the continental shelf, is a very sandy region since these high-velocity currents move large quantities of sedimentation along the ocean floor. These high-velocity currents have created other geological features near the Titanic shipwreck. There are debris, slumps, barchan dunes, sand ribbons and sheets, and mud waves in the area. In time all traces of the Titanic will be buried by tons of sediments moving through the canyon two and a half miles down. The Titanic shipwreck sits south below Flemish Cap off the continental shelf (light blue area) in the photo above. The bow of the Titanic is located at the top middle of the photo. The stern is at the bottom of the photo. The two parts are 1970 feet apart. Also, this region beyond the continental shelf drops very quickly as you continue southeasterly from the Grand Banks to the Titanic shipwreck. 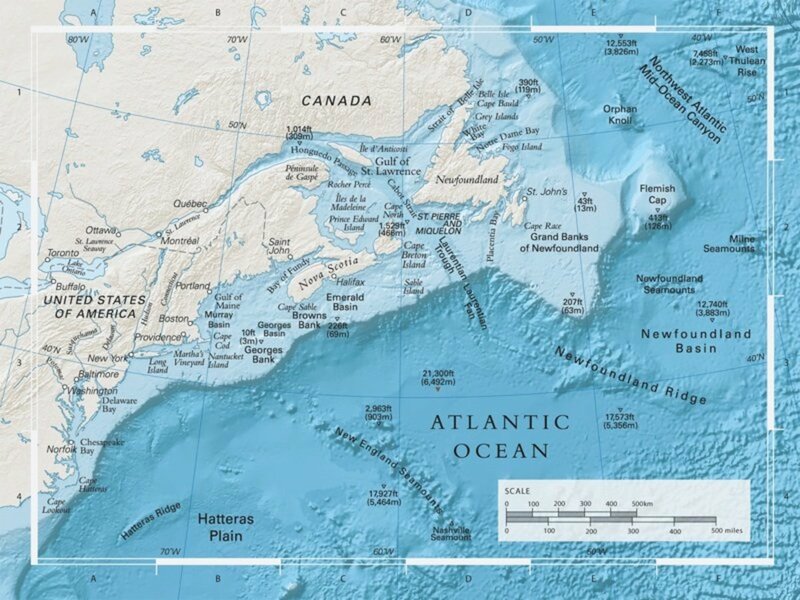 If the collision had occurred about 100 miles closer to Newfoundland, the ship would have sunk on the continental shelf in less than 570 feet of water instead of in the deeper waters closer to the Northwest Atlantic Mid-Ocean Canyon. However, if the Titanic had sunk 100 miles south of its current shipwreck site, it would have been more than 3 miles down in a valley. The wreck probably would never have been found, or it would have taken longer for anyone to find it. The shipwreck is in a canyon surrounded by three low mountains on three sides each rising approximately 2,000 feet from the ocean floor. The mountain west of the site is 30 miles away. The second one is 20 miles south of it, and the closest one is 17 miles north of the site. In 1991 several core samples were taken at the site by the Keldysh Research Expedition Team to study the composition of the sea floor around the shipwreck. Starting from the uppermost layer and moving deeper through the core sample five distinct layers were observed. Fine sand - the surface of the sea floor. Foram ooze - short for foraminiferal ooze. A layer of ooze consisting of microscopic, one-celled, marine organisms often called planktons. There 275,000 species of this organism. Thin Sand Bed - another layer of sand, but not fine in size. Shale Clasts - a layer consisting of fragments (clasts) of pre-existing minerals. The composition of fragments is generally weathered or eroded rocks from hydrothermal vents in the oceans. The wreck of the Titanic is located in a very quiet spot as far as seismic activities are concerned. 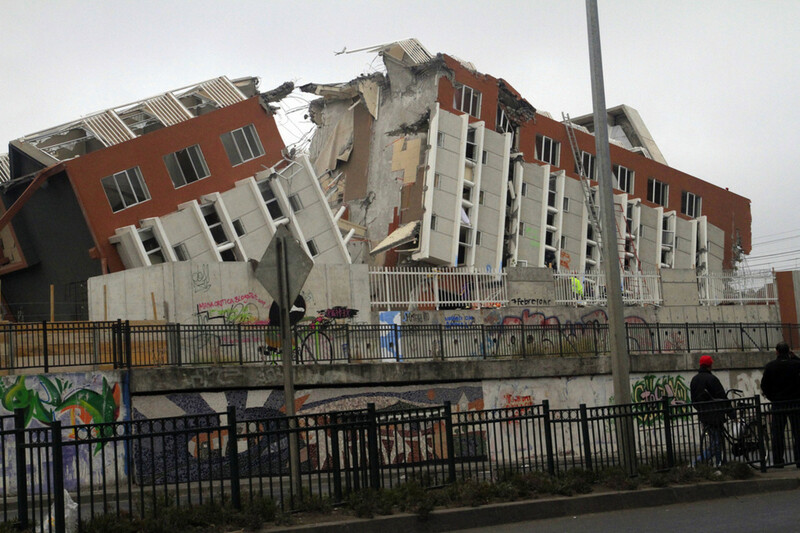 There has been only one major earthquake at a magnitude of 7.2 recorded near the site in the last 100 years. It occurred underwater near the Grand Banks on November 18, 1929, and the quake was called the Laurentian Slope earthquake because it occurred in the Laurentian Slope Seismic Zone south of Newfoundland. At that time it was believed that the shipwreck was buried by a large underwater landslide triggered by the earthquake and will never be discovered. However, that belief was disproved in 1985 when Dr. Ballard finally located the shipwreck. 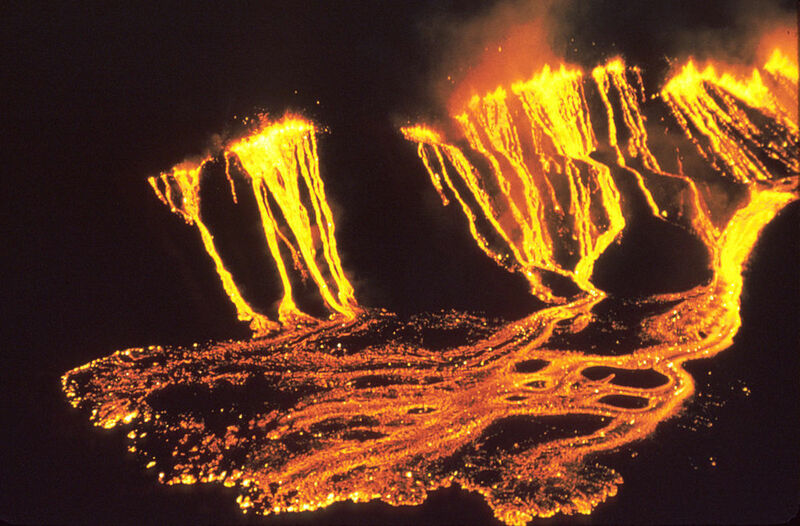 Since the site is a few hundred miles from the well-known mid-Atlantic ridge where the ocean floor is spreading apart, hundreds of earthquakes occur on a daily basis there, some as high as magnitude 5.0 are too far from the site to effect the Titanic shipwreck. In the 100 years since the Titanic descended to its watery grave, it has managed to survive so long despite some of the geological forces and events that have occurred in the area. 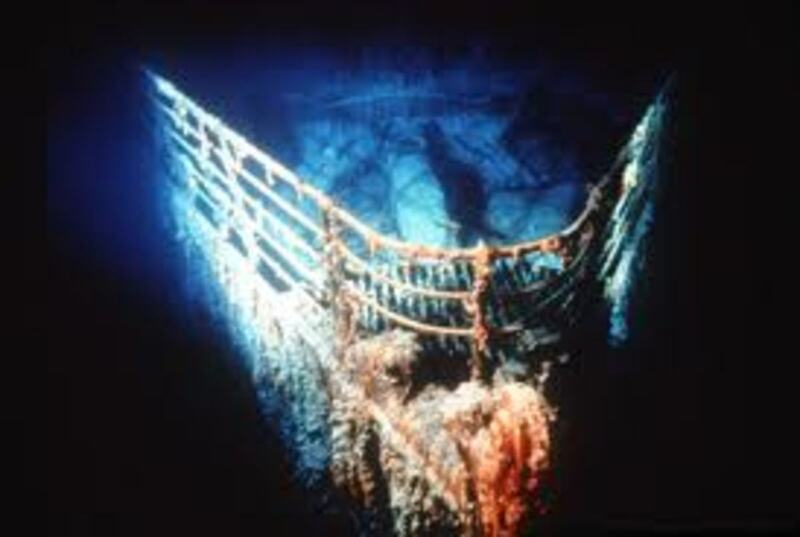 Time is not the only enemy of the Titanic, but nonetheless, it is the microscopic bacteria that is slowly consuming the steel structure of the ship and converting it to rust “icicles” which will eventually dissolve into the cold, dark water two and a half miles down. 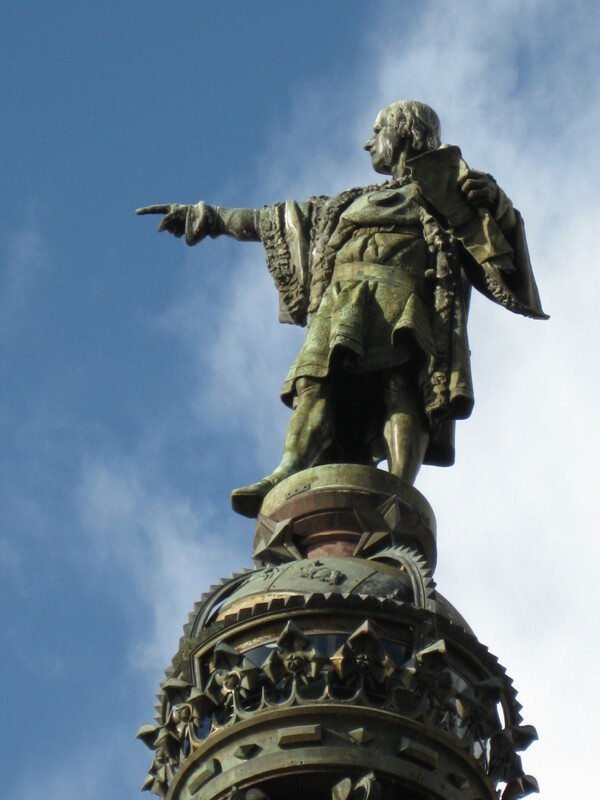 why did the captain not turn when he had the chance? Alright lots of good/different, evidence/opinions on here. this is what i have concluded. first off you've got rich people aboard...wealthy people don't seem to concentrate and crunch numbers like other people do and panic easy. This is what happened. The Titanic was warned by other marine traffic well ahead of time that there were bergs miles ahead. i believe the captain probably figured they were small, being at such a low latitude in the low-mid 40's N' and didn't take it seriously. then the iceberg came, and the watchmen saw it and just like over-steering a car it was too late and what i think happened was two things. they hit it slightly to the side and concaved the boat in the middle. two, they ran over part of the iceberg that you cannot sea above water, and it peeled half the bottom off like a tuna can . that's why the bottom filled up so quick. the reason why debris is scattered like a trail, is because the boat kept going after hitting the iceberg. a train takes a long time to start to put it into perspective. 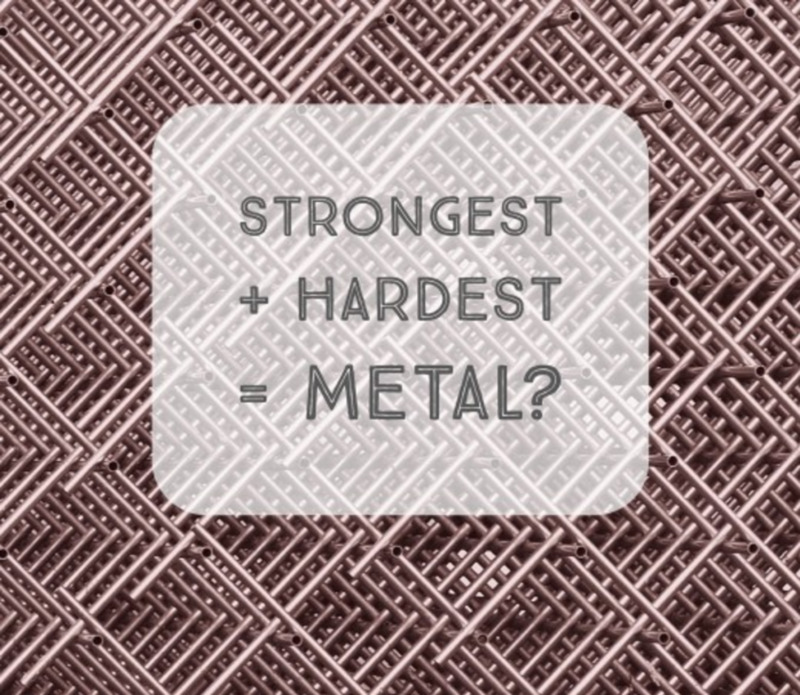 also the bolts that were made to rivet the ship, were under spec for tensile strength by a large margin. Glenn East, thanks for your comment. When the Titanic broke up the broilers went down below the spot where the ship broke up at the surface. The boilers were heavy (about 75 tons each) and went straight down as determined by the investigators of the wreck. The bow went down with some resistance to the flow of water going by it as it went down so there was some horizontal motion in its descent to the bottom of the ocean. The stern of the ship spun as it went down, again with some horizontal motion as it descended and landed facing in the opposite direction of the bow about a half of a mile away since it was spinning. All the other smaller debris were much lighter and basically descended a lot slower with much more horizontal motion to move them further away from the larger pieces of the ship. 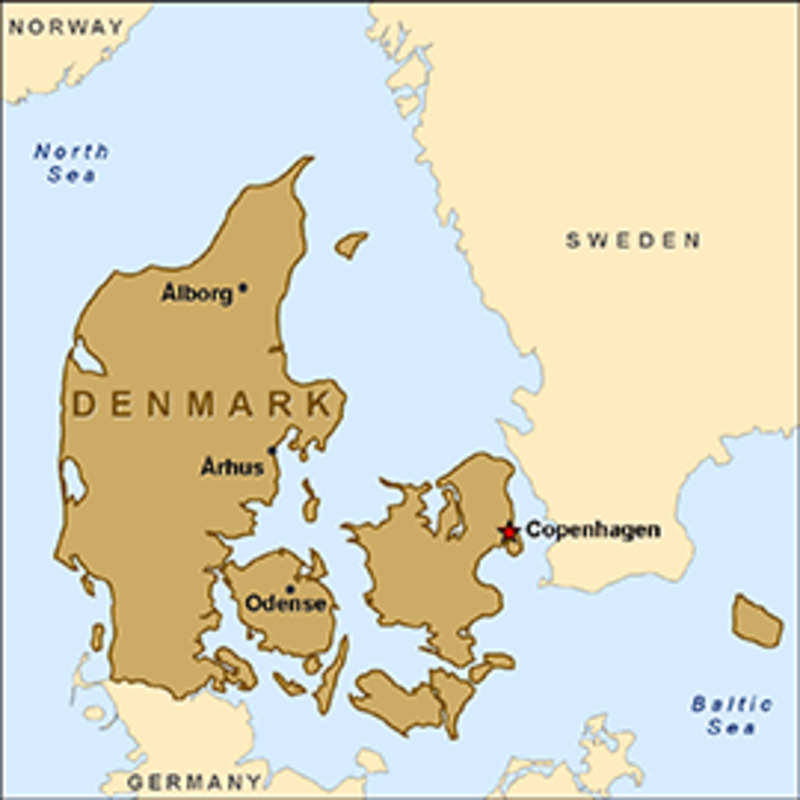 There were also strong underwater currents involved that effect how some of the pieces fell and ended up spreading them over an area of 15 square miles. DS Duby. Thanks for your comment. While Captain Edward Smith was resting his First Officer in charge and the crew forgot what the Titanic was built for; it was built for luxury not to break the Atlantic crossing record that most ocean liners builders were trying to accomplish. Great article, I'm certainly not an expert but from everything I have read on the Titanic, I too believe it may have possibly survived the head on collision, even if only long enough for rescuers to show. Another case of drivers error. vote up with an awesome. Larry Fields,, thanks for your comment. Many investigators believed the Titanic would had survived a head on collision and probably would not have sunk. The ship broke into parts as some said due to the design of the ship. The stress created from the negative buoyancy (submerged under the water surface) on the bow versus the positive buoyancy (floating on the surface of the water) of the stern simply placed too much stress on that part of the ship to cause it to break at that point. Obviously the Titanic was going too fast, relative to the visibility. However there's more to it than that. The fact that the Titanic broke into two large pieces suggests an additional error on the part of the person at the wheel. Apparently, this person panicked, and attempted to turn abruptly when he finally saw the iceberg. Then the ship broadsided the iceberg. If he had been more levelheaded, the ship would have had a head-on collision, and would have suffered less damage. That would have given more time for rescuers to reach the scene, and may have saved a few more lives.